Lee and her puppy in training, Thomas. Blog article written by Olga Trujillo, a lawyer who is dealing with Dissociative Identity Disorder (DID) in Wisconsin, about TMA Service Puppy in Training Thomas and his handler L. Lee Ramey. Through the Years Day Care & Community Center opens its doors to TMA's Service Dog in training, Jaydin. After a morning meeting with the Director of the center, Mary Ellen Shatford, extended a very heartfelt warm welcome to the little one year old puppy, to come into her building at anytime to train around the children for as long as his Handler wishes. Faces of young children lit up when they saw the small dog, and in turn, his swishy tail wagged excitedly seeing them. While it is wonderful little Jaydin loves children (and they love him) it is very important he learns how to ignore them when he is working. That is what his training will be about when he 'goes to school' at the day care center. In a way, the children will be helping to train him by just being the rambunctious, bouncy fun loving little balls of adorable energy that they are. Not only would Jaydin be getting trained and learn how to behave around children when he is working, but the children will learn about- and how to behave around a working dog in a fun way. For example, they will learn why it is important to not touch a working dog when they(the animals) have a vest on. It truly is a wonderful opportunity for everyone involved. We are so grateful to Ms. Shatford for taking an interest in the program. There is no mistaking Rhonda Langille's passion in life. 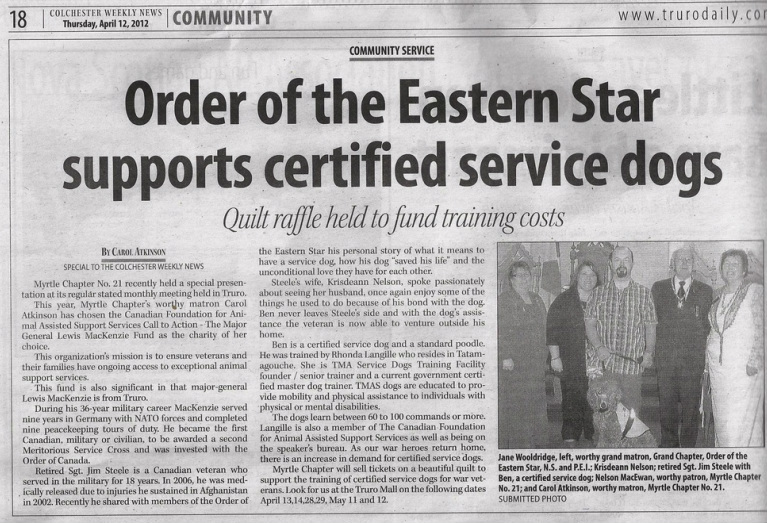 The 53-year-old Tatamagouche resident gets up in the morning and goes to bed at night thinking about therapeutic medical alert service dogs. "My hope is to one day train and work full-time with service dogs," said Langille. "My hope is for a miracle and to eventually have a location to work from. This would allow me to both help veterans and civilians to bring hope to and brighten the lives of many individuals." Langille has worked province-wide with a number of service veterans using a program she developed personally. Part of her story includes ‘Ben,' a red standard poodle she received in 2009 at eight weeks of age. A year later she received a call from Krisdeann Steele who lived in East River near Hubbards. "Her husband Jim was in the Canadian service and had returned from Afghanistan," said Langille. "Jim would not go out in public, he was having problems communicating, he had no sense of humor and he was bothered by light." On Sept. 8, 2010, Langille donated Ben to Jim. "Since that time I have seen Jim make great strides," Langille said. "The dog I trained and donated to Jim played a huge part. Ben would interrupt negative behavior and it went from there. Jim began communicating, coming out in public and he has even spoke publicly. "It brought me tears of joy. Jim Steele and his family feel that Ben is the miracle that they prayed for. The Steele's see Ben as a lifeline and a miracle worker." Langille became interested in dogs as a youngster growing up in Halifax. "My parents had a boarding house," Langille said. "Many of our boarders were service veterans who came from the old Camp Hill Hospital. We always had dogs and I learned right away about the love affairs that can develop between veterans and animals. It is something I have carried with me all my life." With a work background as a personal care worker and doing EKG's at two Halifax hospitals, Langille moved to Tatamagouche during the early 1980s. "For approximately 30 years I have lived between Tatamagouche, Truro and British Columbia," she said. "Because of my lifelong interest in dogs I went to Salmon Arm, B.C., in 2008 to learn more. It took some time but I received my certification for master dog training." Returning to Tatamagouche late the same year, Langille began training service dogs and focusing especially on helping Canadian veterans. "The dogs would eventually be donated to someone in need," Langille said. "I have also been working with dog trainers. I'm fully certified to teach trainers." A dedicated individual, Langille has made it a point to contact government officials, MLAs, mental health groups, the Canadian Paraplegic Association as well as Veterans Ombudsman and others regarding her goal. Funding is a huge obstacle," she said. "There are many expenses involved but behind the scenes I appreciate that both companies and individuals have helped. I have to keep working to secure financial help and at present I'm very hopeful that two potential sponsors are going to become involved. I'm always interested in hearing from any interested people." Langille has heard from wives of veterans and their husbands. "It makes me want to do more." To bring awareness to service dogs and her work regarding veterans, post traumatic stress disorder and anxiety disorders, Langille makes public appearances and puts on demonstrations. "I want people to know what service dogs can or cannot do," she said. "And that a veteran, once trained by this program, will be able to work with another veteran." Lyle Carter column appears every Tuesday in the Truro Daily News. If you have a column idea, contact him at 673-2857.
Who's the TownCryer submitter who thinks she knows how to train dogs? You've read her articles in TownCryer News, but what does she really know? Is she the right person for YOUR dog? Can you trust the tips she gives? Who is Rhonda Langille? Rhonda Langille, of Tatamagouche Nova Scotia, has dedicated her entire life to animals. She has fostered many abandoned animals, both domestic and wild, and helped place lost pets with educated pet owners. She's done numerous speaking engagements at schools to promote pet ownership and proper interaction between children and their pets. Rhonda is a Canine Behavior Specialist. Part of her training included private lessons from Charles “Chuck” Eisenmann, trainer of the seven dogs used in the 1960 series “Littlest Hobo”. For over 35 years, Rhonda has been working with and training dogs. One of her specialties is preparing puppies to become true kids' dogs. She has an extremely strong belief that if you are bringing children and dogs together you must ensure that it is a good union and this can only happen if the dog is friendly, forgiving, gentle, and tolerant of children. As a teenager, Rhonda educated Timi, who performed in fairs and exhibitions throughout Nova Scotia and as a canine clown at children's birthday parties. Timi also gave shows for local childrens' groups and appeared on TV commercials. With Rhonda's training, Timi responded to over 110 vocal commands and 95 hand signals. She became known as “Timi the Wonder Dog” when she performed on the Christmas Daddies Show. 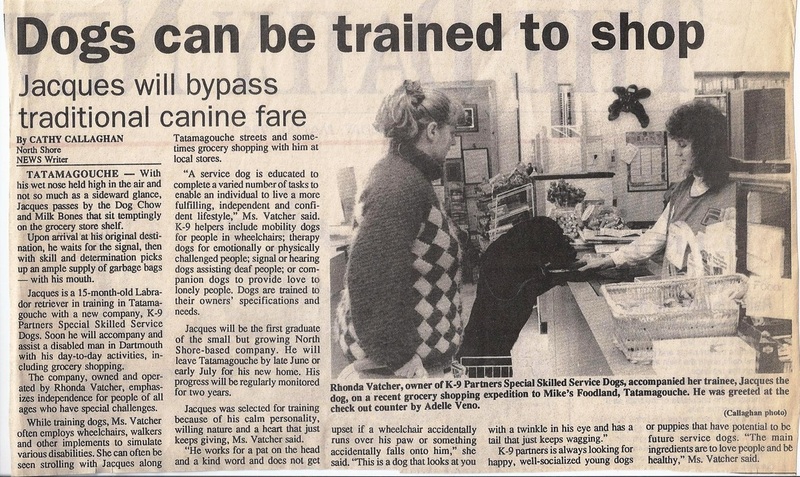 In 1981, Rhonda published a book called Trained Dogs Make Good Citizens, a step-by-step training guide for dog owners. She was writer and columnist of the Truro Daily News column Dear Max, through which she responded to readers' inquiries about dog training. Rhonda is a Government Certified Master Dog Trainer. Master Trainers have the knowledge and skills to successfully train any dog to any level of service. One of her specialties is training Service Dogs to help improve the functional capabilities of persons with physical challenges and/ or individuals living with mental illness, including post traumatic stress disorder. These dogs include: Mobility Task helper dogs for wheelchair bound individuals; Signal dogs for the deaf and hearing impaired, Paramedic dogs for individuals who suffer from mental illness; Medical Alert dogs for various unique physical and chemical challenges (including peanut and chemical sensitivities); and Autism Service dogs that are trained to alert the handler of certain behaviors. Rhonda also trains Seizure Alert and Response dogs that alert the handler to oncoming seizures and are trained to respond to those seizures after they occur by helping and/or getting help from others. Rhonda was featured on the CBC series Land and Sea educating a service dog puppy. As well, one of her working task helper dogs was featured. She has owned and operated a canine boarding kennel and is adept at re-training and rehabilitating behavior problems in dogs. She has experience with Canadian Kennel Club obedience trials and shows and has trained working security dogs and tracking dogs. Individuals who receive Rhonda's Service Dogs gain a new sense of independence and confidence that enhances their lives immeasurably. Joey Outhouse, of Digby Nova Scotia, is an incomplete quadriplegic who must rely on his wheelchair for transportation and has limited use of his hands and often had to rely on friends to help him with daily tasks that most people handle with ease. When Joey contacted the Canadian Paraplegic Association seeking some form of assistance so he could become more self-sufficient, he was referred to Rhonda. Joey's life changed immensely upon receiving Jack, a black Labrador Retriever trained by Rhonda to meet Joey's needs. Rhonda, founder of Therapeutic Medic Alert Service Dogs, is now breeding, raising and training a fleet of service dogs to meet the needs of mentally and physically challenged individuals in her blossoming business. At present, the majority of Service Dogs come from Ontario and the United States. These organizations require that a handler of a Service Dog must be able to prove he/she is financially able to care for the dog. Rhonda is in the process of starting a foundation to help with the cost of funding her Service Dogs. A special fund is being established for the purpose of providing financial aid to anyone who is facing financial challenges. With this fund, monies will be allotted for caring of the Service Dog, including dog food, veterinary care, and grooming for short term or, if required, the life time of the Service Dog. Rhonda still enjoys training and rehabilitating dogs as pets and she is more than qualified to teach your dog just about anything - from learning to not bark incessantly, to... yes, even clearing your table of dirty dishes! Rhonda can be reached by email at rholang@inbox.com or by calling (902) 657-0092.